My book Colours from Nature has been out of print for a while and Search Press has decided not to reprint it. So I have taken over the printing myself, in collaboration with D T Craft & Design, who will distribute the book. The book has just been reprinted, this time with a coiled (spiral) binding, so it will lie flat when in use. It has a new cover, a few more photos and also has added acetate covers to keep the card covers clean. Colour throughout, including colour sample swatches and some photographs. 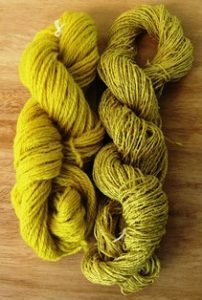 Colours from Nature is a practical handbook for dyers, containing full details of all aspects of applying natural dyes to animal and vegetable fibres, with emphasis on safe, environmentally-friendly methods. The introduction explains the various categories of natural dyes and gives an overview of the historically important dyes. The first half of the book covers the preparation and mordanting of fibres, dye bath preparation and the application of dye colour, with chapters on colour modifiers, testing for colour potential and light- and wash-fastness testing. The comprehensive recipe section, which forms the second half of the book, is arranged according to colour, with recipes for over 100 colours and numerous colour sample swatches. 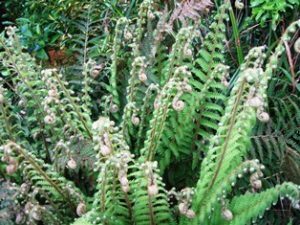 It gives instructions for using all the classic, traditional dyes, including madder, weld, indigo, fustic, logwood, brazilwood and the insect dyes cochineal and sticklac, and also for using more common plants, such as blackberry, rhubarb, oak and walnut. The section on blue dyes has recipes for 3 methods of preparing and using indigo and woad vats, plus useful information for solving some of the problems encountered when using indigo. 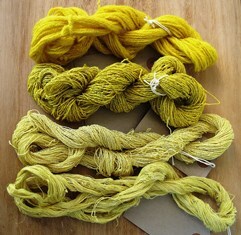 Colours from Nature also includes details for creating some compound colours and for using natural dyes in extract form. 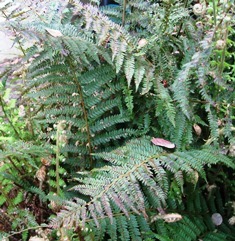 The final chapter lists other useful plant sources of dye colour. Colours from Nature is a complete guide in itself and it is also an ideal companion book to Wild Colour. 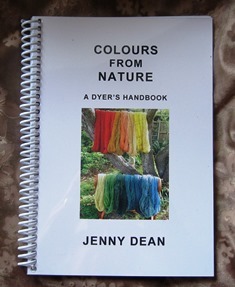 It contains information not included in my other books and many more recipes for specific colours on all fibres. A couple of weeks ago I dyed a final set of samples for the Ethel Mairet project at Ditchling Museum of Art and Craft, following recipes in the 1916 edition of “Vegetable Dyes”. Below are the details of the recipes and the results. 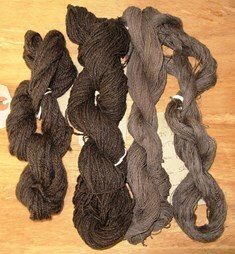 A cold 25% alum mordant was applied and the fibres were allowed to soak in the cold alum mordant solution for 24 hours. 50% madder was placed in the dye pot, together with a handful of bran tied into a muslin bag, and water was added. 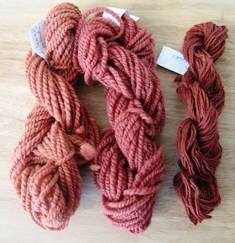 The fibres were rinsed and then added to the madder dye bath. The temperature was raised gradually to just below a simmer, the heat was turned off and the fibres were then left to steep in the dye bath without further application of heat. When the dye bath was getting cool, heat was again applied until a simmer was reached. The heat was then turned off and the fibres left to steep overnight. They were then removed, rinsed and washed. 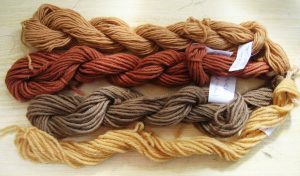 Further samples of wool and silk were mordanted with 2% copperas (iron) and dyed as above, as suggested in the above recipe for brown shades. Wool and silk fibres were mordanted with 25% alum sulphate and the cotton and linen fibres were mordanted with 5% alum acetate. 200% weld was simmered for 15 minutes then the dye liquid was strained off into a dye pot and left to cool. 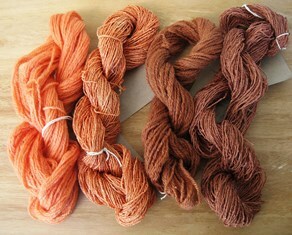 When it had cooled a little, the silk and wool fibres were added and left to steep in the dye solution. They were then removed. The weld was simmered again with the addition of 2 teaspoons of soda ash and this solution was then strained and added to the first dye solution. The dyed fibres were added to this solution and allowed to steep until they had achieved a suitable depth of colour. The fibres were mordanted with 25% alum sulphate. The dyer’s broom was simmered for 45 minutes to extract the colour, then strained. The fibres were gently simmered in the strained dye solution for 45 minutes and left to cool in the dye liquid. They were then removed, rinsed and washed. The fibres were not mordanted. 15% cutch extract was dissolved in boiling water then gently stirred into a dye pot of water. The fibres were added and simmered in the solution for about an hour, then left to cool for a while. 2% iron (ferrous sulphate) was dissolved in boiling water then added to a pot of water. 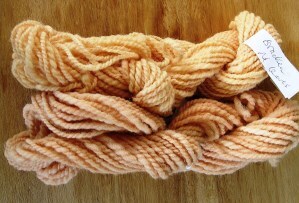 The cutch-dyed fibres were added to the iron solution and simmered for 15 minutes. They were allowed to cool, then rinsed and washed. Samples of wool, silk, cotton and linen were dyed following the instructions on p139 Recipe no. 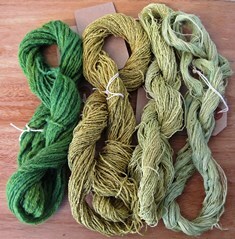 8 for GREEN WITH INDIGO EXTRACT & WELD FOR WOOL. Wool and silk fibres were mordanted with 25% alum sulphate and the cotton and linen fibres were mordanted with 5% alum acetate. They were first dyed blue using indigo extract (Saxon Blue). The fibres were simmered in this indigo solution for about 45 minutes then allowed to cool a little. The weld dye bath was prepared by simmering 100% weld to extract the colour. The solution was strained off and the indigo-dyed fibres were added to the weld dye bath and simmered for about 45 minutes. They were left to cool in the dye bath, then rinsed and washed. 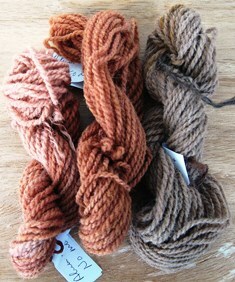 NOTE: Although this recipe is specifically for wool, it was used on this occasion to dye all four fibre types. However, as noted by Ethel Mairet, indigo extract is less suitable for cotton and linen and these fibres did not take up much blue dye. The silk reacted better but the depth of blue on the silk was still less than that on the wool. This meant that the greens achieved were less blue and more yellow in tone.